Canon has fine-tuned proven handling and controls in response to user feedback, and delivered a big gain in continuous shooting performance. It also pushes the Nikon D5 all the way for image quality within its standard sensitivity setting. We can expect to see quite a few 1D X IIs at the Olympic games this summer. 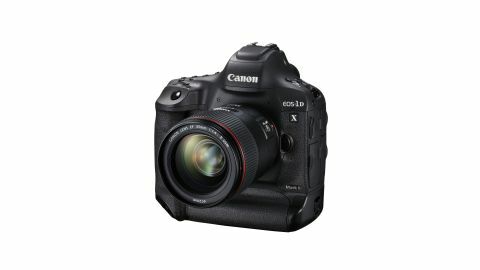 The Canon EOS-1D X Mk II is a replacement not just for the original 1D X, but also for the EOS-1D C pro video camera. And while in some areas the Mk II seems like a modest upgrade of the tech in the 1D X, in others it breaks entirely new ground. The big news stories are the Mk II's amazing continuous shooting mode, its improved autofocus system and its 4K video capability. Canon set out to deliver "the ultimate combination of image quality, resolution and speed" in a camera designed to give photographers a "competitive edge". The EOS 1D X Mk II has a brand new sensor, but it offers only a modest increase in resolution over the original 1D X's, from 18.1 million effective pixels to 20.2 million. That may seem very low in comparison to the 50 million pixels of Canon's 5DS and 5DS R, but the 1D X Mk II is about speed and low-light shooting – it's designed to be a workhorse for professional sport and news photographers. Having fewer pixels on the same size sensor means each photoreceptor is larger, and therefore able to capture more light. As a result the image signal requires less amplification than it would with a highly populated sensor, and so images have less noise. Canon has also integrated the A/D converter circuitry into the sensor, which means the analogue signal from the pixels doesn't have to travel as far before it's converted into a digital signal, and as a result there's less opportunity for noise to be introduced. These facts combine to help keep noise levels down throughout the sensitivity range. Nevertheless, Canon has kept the 1D X Mk II's standard sensitivity range the same as the 1D X's at ISO100-51,200; however, the expansion settings take it to ISO50-409,600, whereas the 1D X tops out at ISO204,800. While the maximum setting is high by most camera's standards, it's three stops lower than the ISO3,276,800 that's possible on the D5. In addition to the new sensor design, the use of two Digic 6+ processors helps keep noise levels down by enabling the 1D X Mk II to apply complex noise-reduction algorithms. But of course, the main reason for this mighty processing power is to facilitate fast continuous shooting speeds. The 1D X II can shoot at up to 14 frames per second (fps) with full exposure metering and autofocus operation (however it drops to 10fps at ISO102,400). The Nikon D5 can only match that rate if the mirror is locked up, and that rules out focusing and metering mid-sequence, as well as seeing the subject in the viewfinder. The 1D X Mk II can perform a similar trick, but it can then shoot at 16fps. To help enable (and cope with) the fast shooting rates, Canon has given the 1D X Mk II a 'refined' mirror system that uses cams instead of springs. This gives much more control over the movement of the mechanical parts at high speeds, and helps control mirror vibration and noise. When you're shooting at 14 or 16fps you really rattle off the shots, so a large buffer is needed. Where the EOS-1D X could shoot 180 JPEGs or 38 raw files in a single burst, the Mk II is able to record an unlimited number of JPEGs and up to 170 raw files. If you shoot at 14fps, 170 images will be captured in around 12 seconds. This continuous shooting speed and buffer depth relies on the latest CFast 2.0 memory cards. The EOS 1D X II has one CFast memory card slot and one regular CompactFlash slot. This gives photographers the benefit of the latest memory card technology, and also compatibility with their existing memory cards. Interestingly, you'll also need a healthy battery to take full advantage of the burst rate – Canon says you won't get the top shooting speeds if the battery level drops below 50%. It's all very well having super-fast continuous shooting speeds, but you'll need an autofocus system that can keep up. At first sight, the AF system in the Canon 1D X Mk II looks the same as the 61-point AF system in its predecessor, with 41 cross-type sensors and five dual cross-type. But Canon has made lots of changes under the hood, with an expanded AF area and a new AI Servo AF III+ system, which improves the tracking sensitivity for subjects that are moving erratically. Canon's latest adaptive 3D tracking system adjusts to your movements as well as the subject's, such as when you swivel to follow a subject moving past you, for example. The autofocus tracking is aided by the 1D X Mk II's new 360,000-pixel RGB+IR metering sensor, which provides improved subject detection – an interesting example of how metering and focusing work closely together in the latest cameras. One further improvement will be big news for photographers who routinely use long telephoto lenses with teleconverters: all 61 AF points now work at f/8. Canon has had Dual Pixel CMOS AF technology on APS-C format cameras like the 80D (and previously the 70D) before, but this is the first time that the technology has appeared in a full-frame camera. It means the 1D X Mk II has phase-detection autofocus points on the sensor to enable faster focusing in live view and video mode. However, because fast focusing isn't always an advantage when recording video, it's possible to reduce the speed via the menu. The EOS-1D X Mark II can shoot stills faster, and for longer, than ever before, but it also introduces another major new feature: 4K video. This has been around on mirrorless cameras for a while, but it's the first time it's appeared on a stills-orientated Canon DSLR. It means the camera will appeal to the growing number of pro photographers now being commissioned to shoot video footage as well as stills. Dedicated videographers, however, will be better served by a dedicated video camera that has an electronic viewfinder, more video-centric handling and contrast suppressing Log-modes. That said, it's great that the 1D X Mk II can shoot shoot 4K at 30fps and 60fps – that requires serious processing power, and it means you can record smooth 2x slow motion footage at 4K resolution. Interestingly, the Mk II shoots 'real' 4K at 4096 x 2160 pixels, rather than the slightly smaller UHD format most other cameras refer to generically as '4K'. The one possible complication is that this 4K video is slightly wider than the standard 16:9 ratio used by UHD, full HD and standard HD – it's actually closer to a 17:9 ratio. Another anomaly is that the 1D X II can't save 4K to an external recorder via HDMI – it's restricted to 1920 x 1080. 4K can only be recorded internally, which seems a little odd, but perhaps this aligns the camera more strongly with the occasional video shooter rather than the dedicated videographer. Canon has chosen the Motion JPEG format for video capture, because this stores a full image for each frame of data and allows the extraction of 8.8-megapixel stills. It means photographers can capture good quality still images at 60 frames a second, albeit not at the sensor's full 20-megapixel resolution. Grabbing stills from video is being taken much more seriously with the advent of 4K. The 1D X Mk II's new Dual Pixel CMOS AF sensor plays an important part in video recording, enabling fast and smooth autofocus during filming with the camera's Movie Servo AF and touch-panel autofocus point selection. And the 1D X Mark II takes another step forward relative to its predecessor with the addition of a headphone socket. Sound is a major part of any video production, and it's important to be able to monitor the sound the camera is recording as you film in case you need to reshoot.